I now consider a free walking tour obligatory every time I visit a new city. On the Porto Walkers tour, I felt like I got under the skin of the city while gaining personal insights into life in Porto. A real highlight for me was stopping off at a wholesale bakery not normally open to passing trade/retail but being allowed to buy the most AWESOME dessert because our guide could organise it. And, of course, he gave us the insider tips and curious anecdotes that only locals can give you. I’m not sharing them here because you should do the tour! The tour group was quite big – at least 20 – but our guide had no problem reaching and engaging everyone while also managing to answer everybody’s questions. Tipping is at your discretion; 10 Euro seems to be quite common although I’ve also seen people tip 20. It starts at Praca de Liberdade and ends, very conveniently, on Cais de Ribeira where you can then go for lunch or take a river tour. This was one of the first stops on our walking tour and is famed for its tile art. I’ve seen a LOT of tiles on previous trips to Lisbon, but this is quite exceptional. The tiled walls depict historic scenes such as battles and royal weddings but it really helps to have a guide (or guide book) explain the significance of these scenes. I love what I learned about its architect, Jose Marques de Silva: he often forgot to plan toilets and ticket offices in his designs, but he never forgot to leave his signature on the building. I find this very endearing as it’s the kind of thing I’d do (if I were brilliant and famous). I love when someone in a picture looks right back at me. Several boat companies along the quay offer tours of the six bridges, lasting about 50 minutes. The boat tour costs 15 Euro and is a lovely way to view both Porto and Gaia (on the opposite side of the Douro) while learning about the six bridges, their design and construction. This church is most famed for its 600 kilos of gold. As I once lived in Rome for a short period and have seen many European basilicas over many years, I’ve well and truly had my share of them and rarely feel the need for a Baroque/Rococo binge, but I figured I’d just have one for the road. And what a binge it was! I don’t quite have words to describe so much gold in one place but I guess I could start with ‘spectacular’. In terms of a focal point, I would recommend taking a good look at the Jesse tree wood carving and taking time to read about its symbolism. You’ll also note anti-Moorish propaganda in another piece of art which I found gory and fascinating. The catacombs and ossuary beside the church are included in the five Euro ticket but I wasn’t too excited by them. They’re worth a look but not unmissable. The market should be visited relatively early in the day. It’s mainly a food and drink market with a few souvenir stands selling the very essential cork handbags, tiled trays and embroidered goods that cause us to exceed our baggage limit on the way home. I loved it for its atmosphere, buzz and elderly traders going about their business. As I write the word ‘authentic’, I’m cringing but it is actually an authentic experience! I picked up some spices there and they are really potent and bursting with flavour. The exterior of this church is stunning. Yes, you’ve guessed it: more cool, blue tiles. I even wore a nice blue top on my second visit as it was a perfect match for the tiled facade which meant I blended in very nicely in my photo of me and the church. Gaia, just across the river Douro, is where you find all the port wine cellars and tours. It’s technically another city but it’s just a short stroll across the Ponte Luis 1; it barely feels like another neighbourhood. All the mega brands are lined up along the quay – Sandeman, Grahams, Cockburns etc. Many are no longer Portuguese-owned but venture into the back streets and you’ll find smaller, local producers which often offer better value and a less corporate experience. 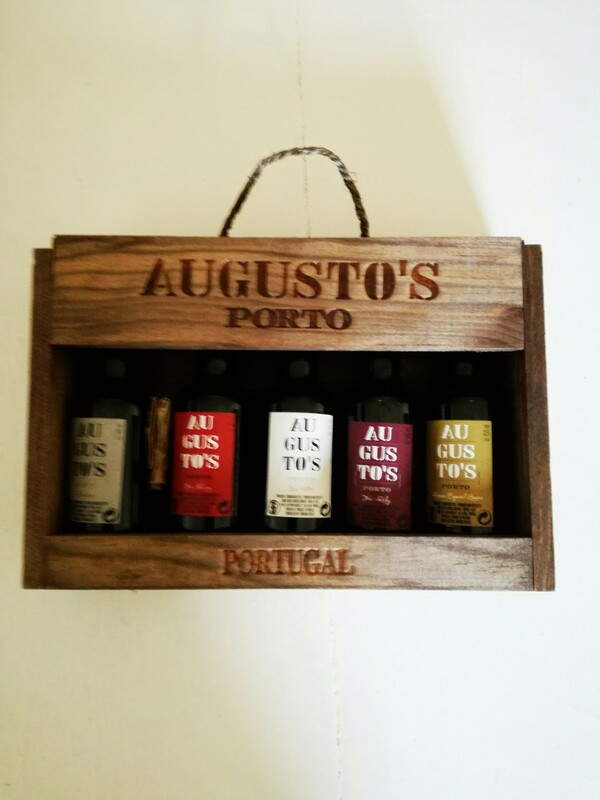 I liked Augusto’s, a Portuguese third generation family-owned cellar. The tour cost 5 Euro with a tasting at the end, offering two VERY generous servings of port wine. You won’t find their port at the airport or back home but they ship all over the world. You can also take the cable car at Gaia and view the district and river from above – maybe before, not after, the port wine tastings. You can reach Afurada by taking a tram from Cais da Ribeira and then taking a boat taxi across. I was pressed for time, however, so I walked over to Gaia at Ponte Luis and got a taxi from there for about 7 Euro. If you can’t find one, one of the nice shop owners might call you a local cab. Other attractions around Porto: Clerigos Tower, the most beautiful McDonalds in the world (yes, seriously), the oldest stamp shop in Porto, the Lello bookshop (famed for its Harry Potter staircase), Serrralves Museum of Contemporary Art, Casa da Musica. A quiet word on Franceshina…. you may be told that this heart-attack-on-a-plate is something you must experience on a visit to Porto. Personally, I couldn’t stomach this ‘bread, wet-cured ham, linguiça, fresh sausage like chipolata, steak or roast meat and covered with melted cheese and a hot thick tomato and beer sauce served with French fries’ dish. (I was already carrying some unwanted pounds and didn’t feel like adding to them for the sake of a dish that sounds rather disgusting.) There is, however, a compromise. 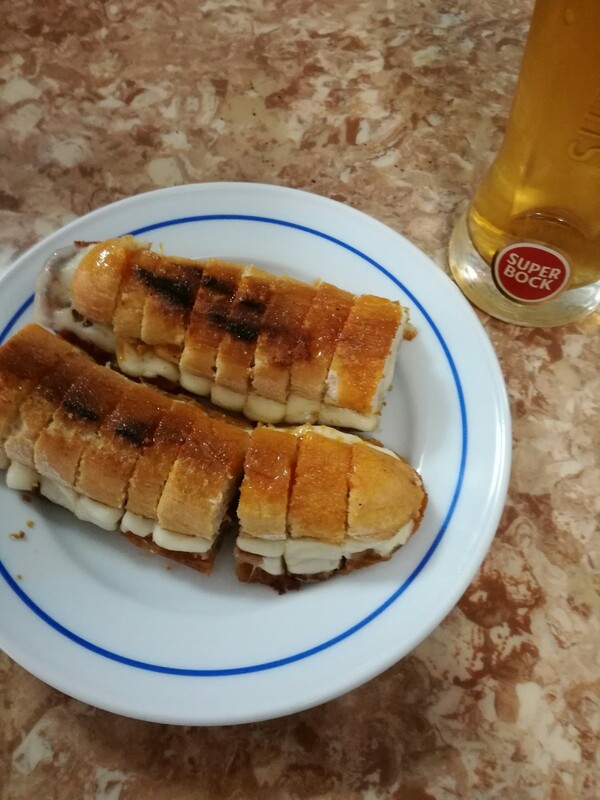 The Cervecereia Gazela (beside the Teatro Nacional Sao Joao) is legendary for its hot dog which is not really a hot dog (more of a sausage panino), as recommended by Anthony Bourdain. Porto natives are very proud of this no-nonsense eaterie where social status is irrelevant, as doctors, actors and the homeless turn up for a quick but wholesome feed during the day. A legendary hot dog and beer will set you back about 4.50. I completely fell in LOVE with Portugal but haven’t yet made it to Porto — just Lisbon and the Algarve. Dying to go back!!! Ahh, I love Portugal! Your post makes me want to go back! Loved this post! I’ve been thinking more and more of visiting Portugal so I really enjoyed this read. The river boat tour sounds amazing. Portugal is high on my bucket list, especially Porto. Reading this has given me so many ideas of what to do once I go! Great post! This post was so good!! I LOVED the Porto Walking Tours and yes, that chocolate cake is the best in the world! Way to highlight such an incredible underrated city. I hope more people see the charm of Porto and give it a visit. Great article. Thanks so much, Lorial. I’ll be looking at your blog shortly – great title! Thanks for taking time to read. It’s so nice to get feedback. Toronto is very popular with the young Irish. I’d love to visit Banff some day as well. Thanks very much, Carmela. I’ll taking a look at your blog soon. Looking forward to reading about your travels. I love Porto!! Your post is really interesting, keep doing a brilliant work! I’ve been wanting to visit Portugal for a while now and this has really inspired me! Thank you so much. I look forward to taking a look at your blog shortly.